Unsweetened. Whole grain. No added salt. High fibre. Clean ingredients. No artificial anythings. Non-GM. No refined sugars. Vegetarian Society approved. Kosher - KLBD.Pure pleasure First, the crackly crunch. Then, the taste: toasty and nutty. 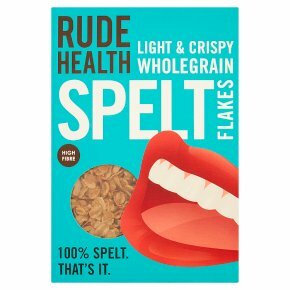 Each flake is one grain of natural spelt, simply steamed, rolled and lightly toasted. This rare approach yields a rare flavour and texture. And let's not forget the healthful inner riches of fibre and protein, immunity-enhancing and digestion-friendly. No added anythings, so you can add your own choice of sweet somethings. The spelt story (it's very old) Spelt is an ancient wheat grain, cultivated since the Bronze Age and grown in Britain since Roman times - that's aeons (yes, actual aeons) before the chemicals and standardisation of today's common wheat industry. Long live spelt! The feel-good factor Spelt tastes irresistibly good, and it's stealing a march on common wheat. It's easier to digest (even if you're iffy about wheat), it's higher in protein, and it has more fibre. If your digestive and immune systems could cheer, they would. For the love of spelt There's a whole lot of spelt in Rude Health. You'll find digestible spelt mixed with heart healthy oats in our Granolas and Mueslis, and in the Thins too. As for our Spelt Oatys, they seriously take the biscuit. In fact, the only thing we haven't put spelt in, is our drinks. All in good time. How we like them Delicacy in a dish: pour your favourite milk all over a spelty heap. That's it. Sweet as you like: add figs and honey, banana and maple syrup, or a handful of fresh berries. Contrast crunchy and soft: sprinkle Spelt Flakes on Bircher muesli, stuff them into a chewy breakfast bar, and give creamy cheesecakes a crispy edge.